….and so we come to the final Occupation and it is perhaps apt that we return to these three albums for these shows. The shows where I played Hefner songs obviously sold out quickest and on a few occasions we ran over to two nights. However these three albums, I feel, represent the best of what I do and I’m happy to indulge in these songs for an evening. It’s about the place I come from and, despite the character lead songs,they are more about me then you might realise. I will have the Secondary Modern with me for this show and support will come from Enderby’s Room (featuring Dan and Emma from the SM). 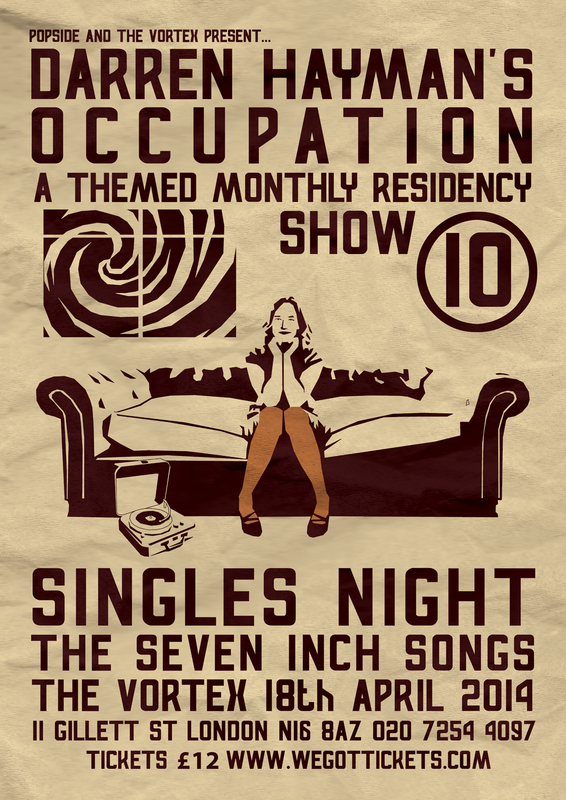 We’re also trying to sort out some DJs for a post Occupation party downstairs afterwards. 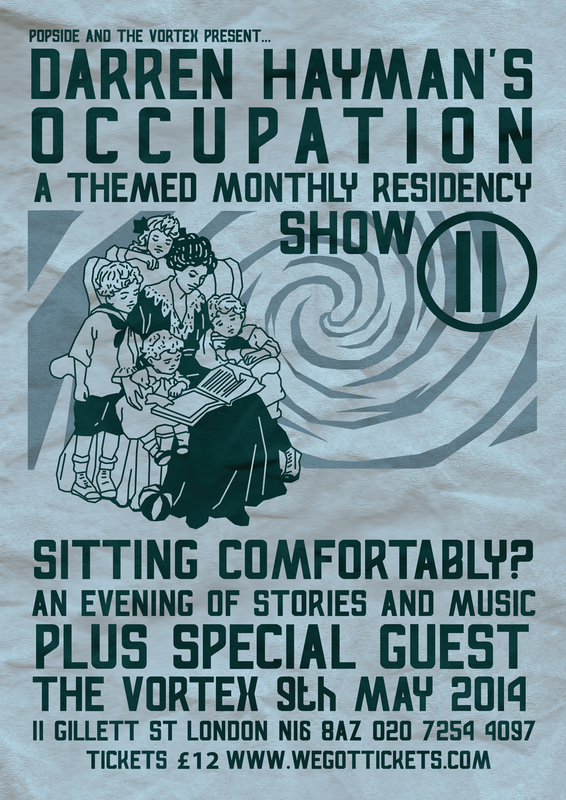 Occupation 11 – Sitting Comfortably? 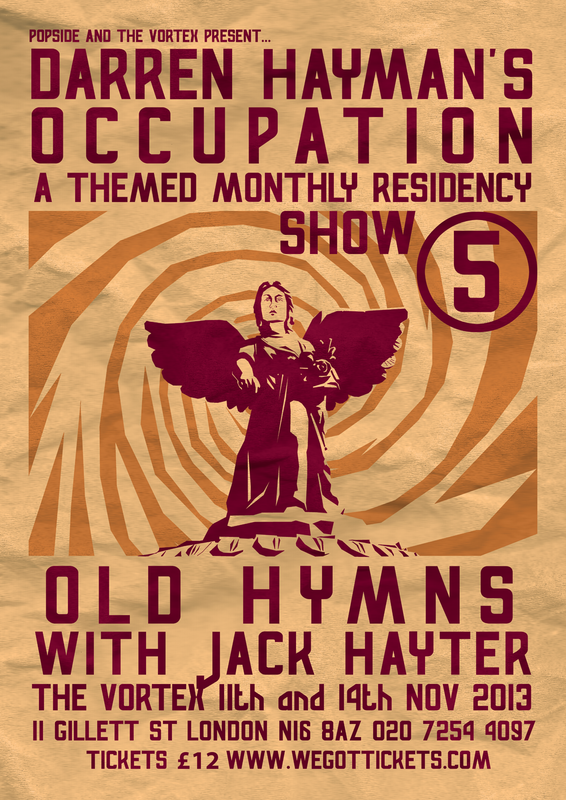 One of the first ideas of the Occupation shows that was by having to do a show each and every month the pressure would lead me to do new and interesting things. 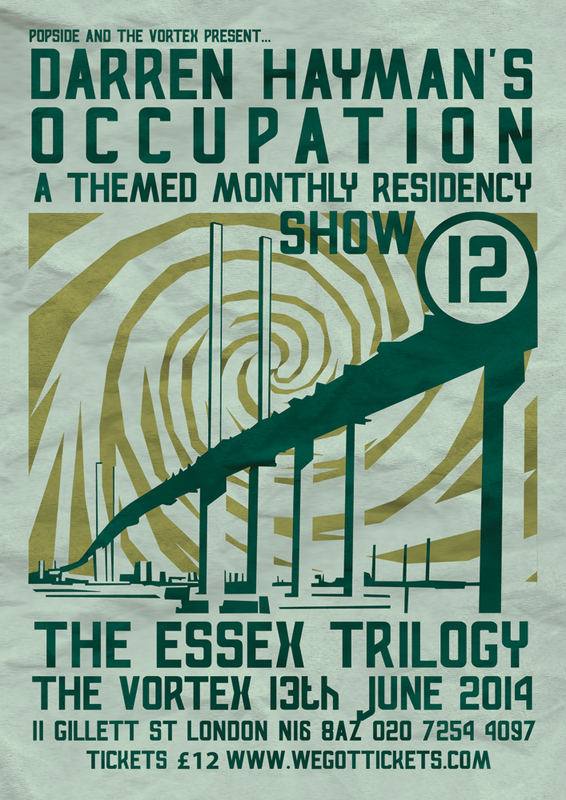 Two of the highlights for me so far have been the improvised spoken word pieces on Occupation 3 and 7. The first time accompanied by free improv artists Gail Brand and Mark Sanders and the second time with my own band, The Long Parliament. I decided to stretch this idea into an experimental of story telling. I will write pieces for the night and ask musicians to provide improvised backing. I will perform the three or four spoken word pieces that have appeared on my records previously. 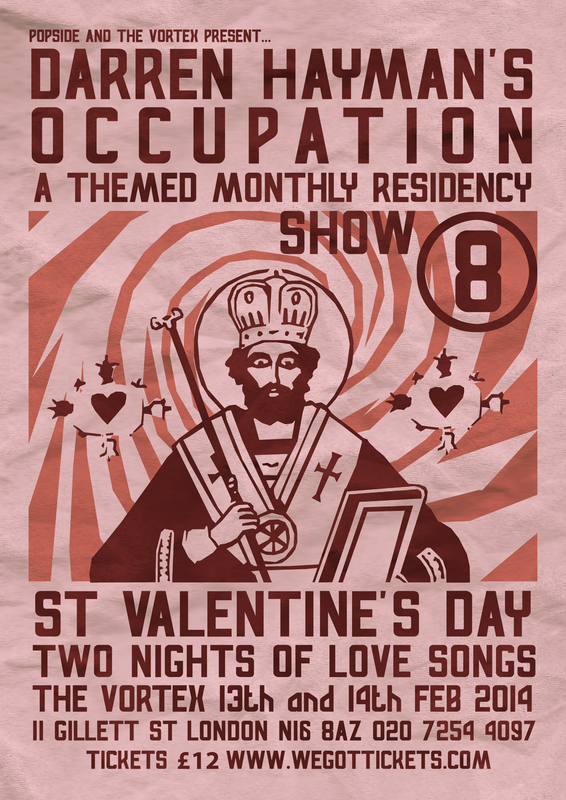 I will also perform the more story based/narrative songs from my back catalogue. So it isn’t totally an evening of prose. The special guest is special, honest. My career as a singles artist has run on a completely different parallel to my album career. In recent years I have preferred to release seven inch singles with songs that don’t feature on the albums. Consequently if you were to look at my run of singles you would get the impression of a completely different artist. Certainly songs like Calling Our Your Name, Old Man, have never been performed live. I plan to do the songs standing up. I will have a tight three piece. We will rock. Support comes from Chris T-T. I’m pleased to have him playing with us. A ferocious, intelligent, political talent. He should be headlining really. In Hefner I wrote a song about Alan Bean, the fourth man on the moon. In 2011 I held an exhibition of paintings about animals and people in space with Robert Rotifer, Sarah Lippet Paul Rains and Duncan Barrett. We also made a CD on which I sung two songs about the Russian Space Dogs. Around 2005 I tried to write and record 12 songs about each of the astronauts who walked on the moon. I wrote seven of them. My own label ‘Belka’ is named after one of the first two dogs to go into earth orbit and return alive. Several other song of mine like The Protons and the Neutrons use the imagery of the cosmos. I want to bring all of these themes and songs together in one show on the 14th march at the Vortex. Usually live I use stringed, folky instruments but I am also known for using electronica. 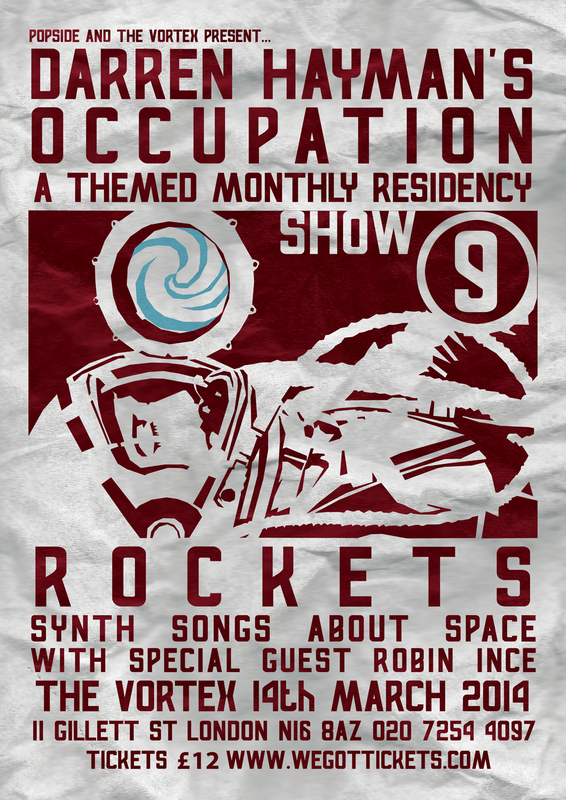 For this show I’m going to bring some of my synthesizers and old analogue drum machines. It will be a treat. Support comes from the famous comedian Robin Ince. Who knows about Space. It’s a simple theme this time. I will play love songs and only love songs. I’ll try to make the two sets slightly different without featuring totally exclusive songs. 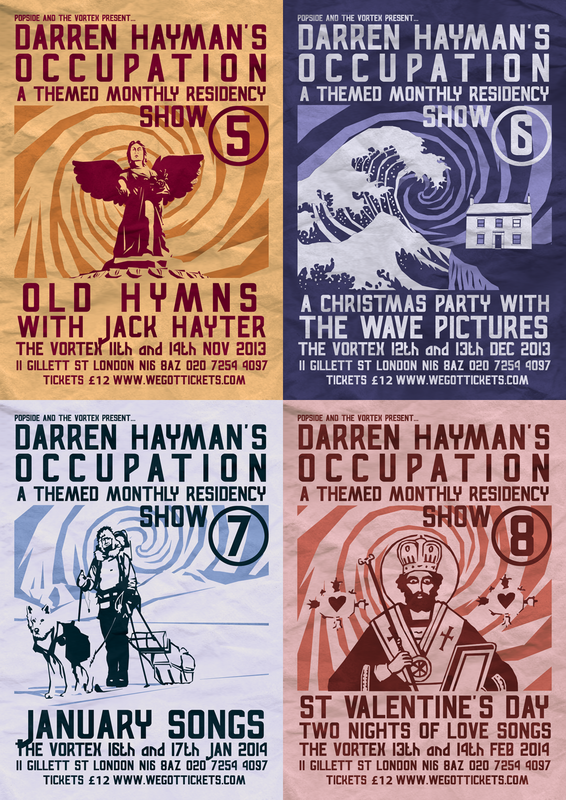 We’re working on some more ideas (akin to the postcards on the Holiday shows) to make the evenings special. 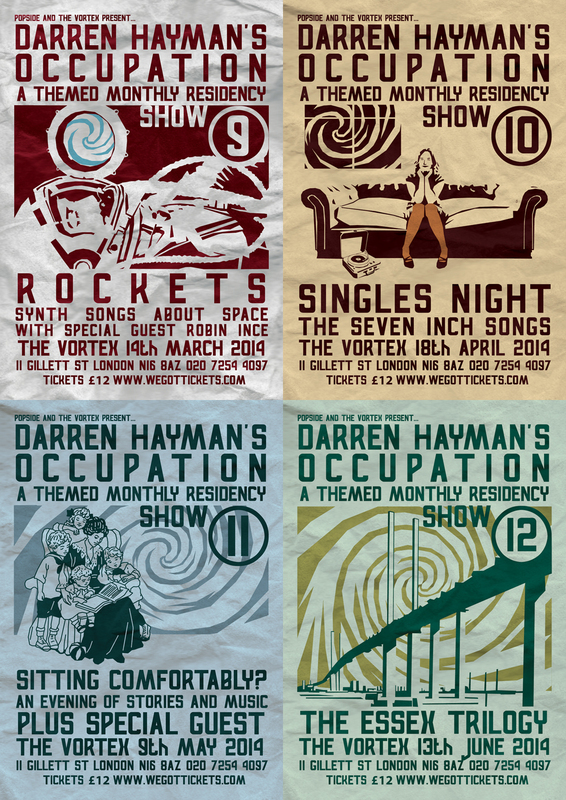 During January 2011 Darren Hayman, ex-Hefner, wrote a song for every day of the month. It was an incredibly frantic period of work. Each day not only included the writing of a song, but also its recording and the making of a video, and an online diary. “Even in this age of downloads I can still get frustrated about how long it takes to release records,” says Hayman. “I wanted to make something instantly and, without anytime for editing or revision, release it and make it permanent. The project became eclectic through necessity. The songs range from glam disco stomps, through folky laments and acapella hymns to jazz backed spoken words. January Songs was also released as a hand drawn two CD set and can be found in our shop. Apart from one or two tunes January Songs has only been performed once, back in January 2012 upon the release of the CD. 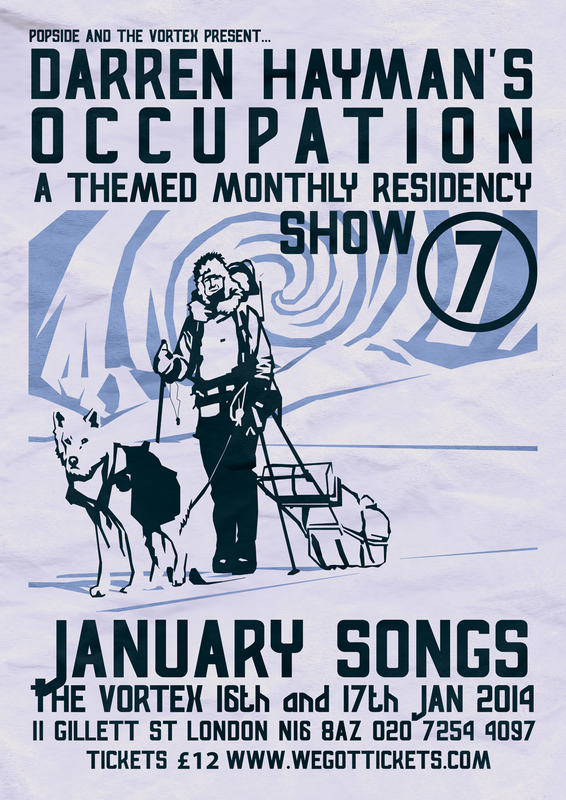 It should come as no surprise that the two January Occupation shows will consist of an exclusive performance of January songs. THE TWO SHOWS WILL FEATURE DIFFERENT SETS. SHOW 1: THURSDAY 16TH JAN WILL FEATURE SONGS FROM THE FIRST HALF OF JANUARY SONGS. WITH SUPPORT FROM THE ROZI PLAIN FROM LOST MAP RECORDS. SHOW 2: FRIDAY 17th JAN WILL FEATURE SONGS FROM THE SECOND HALF OF JANUARY SONGS. WITH SUPPORT FROM THE PICTISH TRAIL FROM LOST MAP RECORDS. 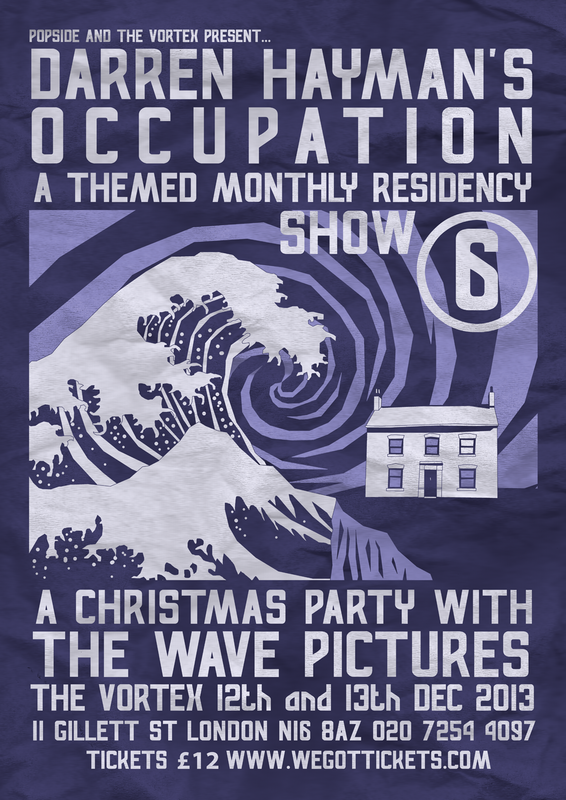 Occupation Show 6 at the Vortex Club will be over two nights on the 12th and 13th December. Darren will be playing sets with The Wave Pictures. It’s a long time ago not but when the Wave Pictures first moved to London back in 2006 for a short while there were the original Secondary Modern. Darren took them to Spain with him and they also did a few UK shows. Since then they have collaborated regularly, playing on each others records and Darren directing Wave Pictures videos. In 2011 they made a single together ‘Who Hung the Monkey’, part of the January Songs project. To make the show extra special we are going to try and organise a secret santa event. Every ticket holder should try and bring a £5 ish present and all of the presents will be swapped and distributed throughout the night. THE SETS ON BOTH NIGHTS WILL BE LARGELY SIMILAR. The theme this time is simple, Darren and his old bandmate Jack Hayter will play the songs of their old band Hefner. Darren and all the members of Hefner have remained firm in their intention that the band will never reform and even nights like these are very rare. The last time Jack and Darren played sets like this was in 2008. This time Jack and Darren hope to turn their attention to the softer side of Hefner. Less Hello Kitten, more Hymn for the Alcohol. ALTHOUGH THEY ARE PLAYING TWO NIGHTS THE SETS ON BOTH NIGHTS WILL BE LARGELY SIMILAR. Support on 11th is from Papernut Cambridge. An awesome new band, formed in a dream and sometimes featuring Darren himself. Support on 14th is from Jack Hayter playing his own songs.